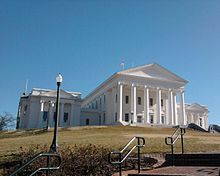 Our VALOR group traveled to Richmond during the General Assembly session this winter to see decision making in action, learn to voice our opinions on pertinent issues and gain a better perspective on just what it takes to keep our State and Country running smoothly. On this visit with VALOR we were able to sit in on the Sub Committee on Agriculture which really brought home how the process plays out. We were there after cross-over so the Committee was reviewing Bills that had already been presented in the other chamber. Some issues had already been resolved and were simply passed by vote to be presented the following day in the General Session. Other issues had passionate citizens vocalizing their views. Each was given time for consideration and then a vote was made. Earlier in the trip we had the opportunity to meet with the First Lady of Virginia and with Todd Haymore, Secretary of Agriculture and Forestry. They shared with us their vision of Virginia Agriculture and the issues at hand. After this big picture perspective, it was good to sit in on the Ag Sub-Committee and General Sessions to get a better sense of how issues are brought forth and how the process materializes. The message I learned – get involved. Don’t just sit on the sidelines. We can each make a difference.